While many people contemplating divorce are worried about the “right” things—alimony, finances, what will come of the family home and other assets, child custody and support, etc.—the one thing many do not realize is that they also need to worry about online security. Unfortunately, it is too easy for your soon-to-be-partner to access your personal data. While smartphones and other gadgets are presumably designed to make life easier, they also arguably create opportunities for couples to snoop on each other. There are simply too many online accounts linked, allowing sensitive information to be accessed by a previous or soon-to-be-ex partner. Products such as laptops, iPads, and iPhones are often synced together, enabling users to access information (such as appointments) from various devices. Apple IDs, iCloud accounts, etc. can provide an ex with access to emails, locational data, messages, and photos without the other person knowing. If you think you don’t need to change your email password—think again. 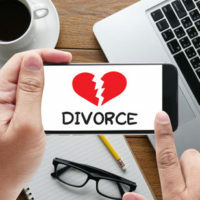 There have been a number of cases where one person thought that their ex could not access their email, when it turned out that not only had they been doing so, but also accessing any and all legal advice related to her divorce case sent via email. Remember that—when other passwords are changed—the relevant link is often sent to your main email address, which (if your ex has access to) would then allow your ex access to all of those other accounts. In addition, chances are that your ex may know the answer to some of the security questions you set up. When devices are handed to children for the purpose of playing games, both the child and the other partner can then access any personal information (such as text messages) that pops up on screen without the need to first enter a password. Federal laws such as the Wiretap Act are supposed to protect your privacy by making it illegal to intercept electronic communications via a device. However, it can be difficult to prove violations of the law, and partners who illegally spy on each other can often cover their tracks and obtain that same information by other means; using the information they gain access to against their ex in court. Just as you would take measures to protect yourself in business, if you are seeking a divorce, you need to protect your personal information. Ensure that you take simple measures, such as changing passwords, never leaving your Smartphone unlocked, and using virtual private networks when using public WiFi. The divorce lawyers of Trachman & Ballot-Lena, P.A. have the knowledge, skills, and experience necessary to ensure that you remain protected as you go through the divorce process. Contact us today to find out more.